We’ve been thinking a lot about just how long the flight from here to San Jose might be with a bored toddler. Unbeknownst to Elise, her mommy has been squirreling away things to keep her busy and quiet. 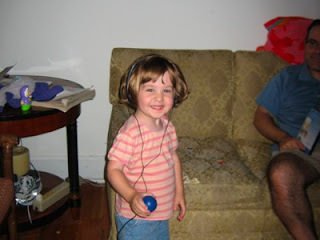 Today, Elise and her daddy added to the stash by purchasing headphones. The plan was that we’d give her some time to get used to them before trying to explain their merits on a crowded airplane.